De Pue's service set up includes one uniformed service representative, vault service & installation, Wilbert way for an above ground seal (providing conditions allow), casket lowering device, cemetery grass, 16 chairs with chair covers and one 15'x15' Hillside tent. Extra tent and service representative are available per our price list. Nameplates give burial vaults a personalized touch. They are a standard feature of Continental vaults and above. For an extra charge, nameplates can be added to the Monticello burial vaults. The nameplate includes the name of the deceased and the birth and death dates. This service includes opening & closing of the grave with small equipment to minimize ground disturbance. 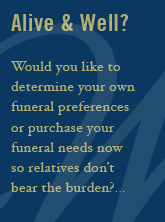 We also provide a hand dug grave service if conditions/location require at an additional fee. Depue Inc handles all aspects of removing a vault, transporting and the final placement in new location.